- Developed as a new series for overseas markets. - Emphasis on transporting people, such as use as a shuttle, for tourism, or private buses, as well as logistics, with the Hiace framed as a "working vehicle". In addition to its role as a van, it is positioned as a commuter vehicle and as a vehicle for tourism. - Basic performance and comfort have been greatly enhanced using a platform specially developed for this new model and a semi-bonnet design. - Highest level of safety in its class, equivalent to five stars in the Euro NCAP. MANILA, Feb, 18 2019 - (JCN Newswire) - Toyota Motor Corporation announces today it has unveiled in the Philippines its first new Hiace model designed for overseas markets. The new Hiace is built on a special revised platform that not only greatly enhances comfort and safety, but is extremely durable with excellent basic performance, making it suitable both for customers' daily lives and for business. In emerging markets, where the automobile market has continued to expand throughout approximately the last decade, demand has risen for passenger transportation including tourist minibuses, private buses, and vehicles for use in logistics. The new Hiace has been developed to be able to flexibly respond to these diverse needs. Following launch in the Philippines, the new model is to be gradually introduced in other countries and regions, with a focus on emerging markets. The current Hiace model will continue to be sold in Japan as-is, due to the different local market environment. "The Hiace was developed using the key words of 'Hiace Pride', and from the concept of being a faithful partner that makes people feel safe, satisfied, and proud. Owners, drivers, and passengers know they are in good hands when they own, drive, and ride in a Hiace," commented Chief Engineer Takuo Ishikawa, who was responsible for development. Since the launch of the first-generation Hiace in 1967, it has become one of Toyota's representative global vehicles, with more than 6.24 million units sold in over 150 countries. The Hiace demonstrates prowess through its high durability and reliability, and has been used as a van, a minibus, and as private transportation. Currently, it is largely sold in Asia, the Middle East, Africa, Oceania, Mexico, and Latin America. - Two body types are available: Normal/Standard Roof and Long/High Roof. - Leveraging the semi-bonnet package, the Hiace's most important features--its reliability, toughness, and functional beauty--are evolved and enhanced, creating an external style that suggests a comfortable and sophisticated space. - Layouts with multiple rows of seats or increased storage space are available to suit various uses*. - Up to 17 people can be carried in the "Commuter" versions--the most in its class--for private bus use. - A specialized interior and functions for comfort are adorned in the new "Tourism" versions. - The "Van" versions feature storage space sufficiently large for pallets from any country or region. - The comfortable interior design provides peace of mind while functionality for driver and passenger needs is upgraded, as demonstrated by large door pockets and generous under-seat stowage. 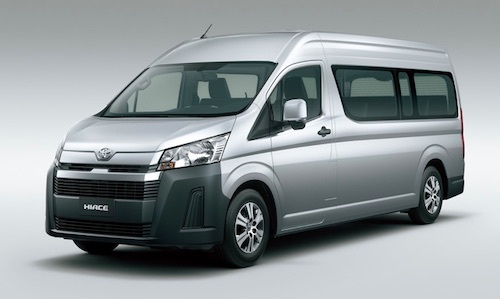 - The new Hiace offers greatly improved ride comfort, quietness, and safety via an all-new body based on the design ideas of TNGA (Toyota New Global Architecture), such as high-level body rigidity achieved through ring-shaped frame structures. - The comfortable interior reduces driver fatigue even over long distances, and high durability delivers safety and peace of mind whatever the road conditions. - The engine is available either as the 1GD (2.8-liter diesel) or the 7GR (3.5-liter gasoline). The Hiace comes with Toyota Safety Sense and achieves performance equivalent to five stars in the Euro NCAP.